All passionate DIYers who love to swing the hammer themselves or to use a nifty drill and combpliers should equip their hobby workshop with some original WALTER tools at an incredible price! Cordless drills, electric saws, garden shears or a tool kit: the WALTER outlet store in Anif is a paradise for craftsmen. It offers a huge selection of tools and accessories at unbelievably low prices! 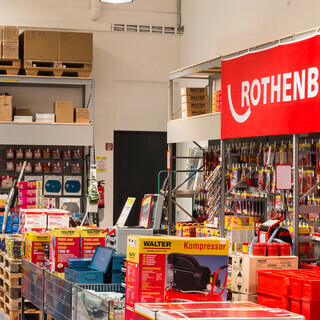 Among the WALTER outlet selection are battery-powered devices, drills, hammer drills, saws, grinders and all-purpose vacuum cleaners. Garden equipment like cordless grass and hedge shears, pressure washers and lawn dethatchers can be found there, too. Get incredible discounts on accessories – for example: drill bits, saw blades and sandpaper. Visit the WALTER outlet store in Anif – it pays off! We closed between 24.12.2018-01.01.2019 due to inventory and public holidays. We are happy to be back for you from 02.01.2019.